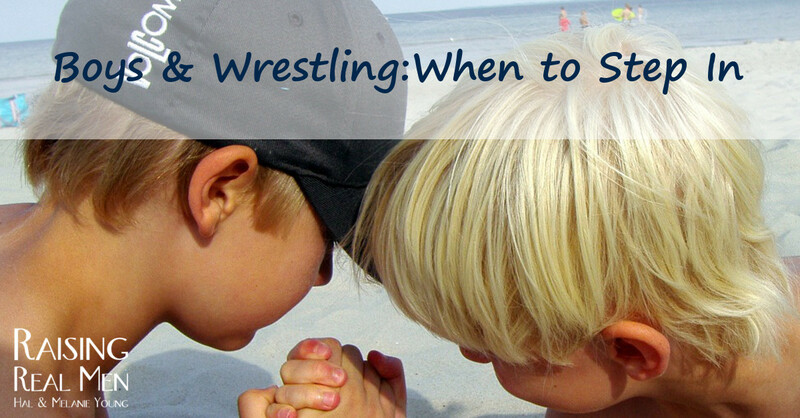 Raising Real Men » » When Do You Step In When Boys Are Wrestling? 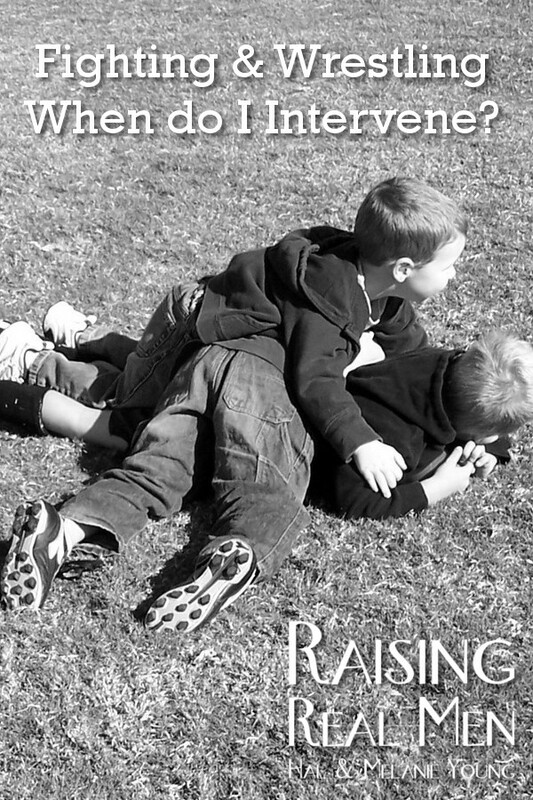 The way boys are always wrestling can be pretty frustrating, especially for moms. It’s hard to know if or when to step in and if you don’t, it seems like it often ends in someone angry or in tears. It’s important for boys to learn to be comfortable roughhousing with other boys and testing their strength against one another. Having physical courage is an important part of being a man and being comfortable in the role of protector. How do you keep it safe and healthy, though? Our rules are pretty simple. For one, you don’t wrestle in the living room or kitchen. I would like to have a few nice things when they’ve all left home! The kitchen, on the other hand, is just too dangerous with boiling water, hot grease, and sharp things lurking around. The other rule is that if anyone says, “Stop!” or “Knock it off!” it must stop immediately or you are a bully and we discipline quite firmly for being a bully. We explain it to them like this: When fighter pilots are training, when they are doing war games, for example, if anyone broadcasts, “Knock it off!” they immediately disengage and separate. That means there is some danger or some other reason that they need to stop for everyone’s safety. In the same way, wrestling is a war game; it is practice combat. Because it’s practice — You certainly have no intention of hurting your brother, at least, you’d better not! — there’s got to be a way to call it off if someone is getting hurt or needs to stop. If you can’t keep this rule of mock combat, then you aren’t mature enough for war games and you won’t be allowed to wrestle. This works well for toy sword play, rubberband guns, any kind of play that involves pretend fighting. 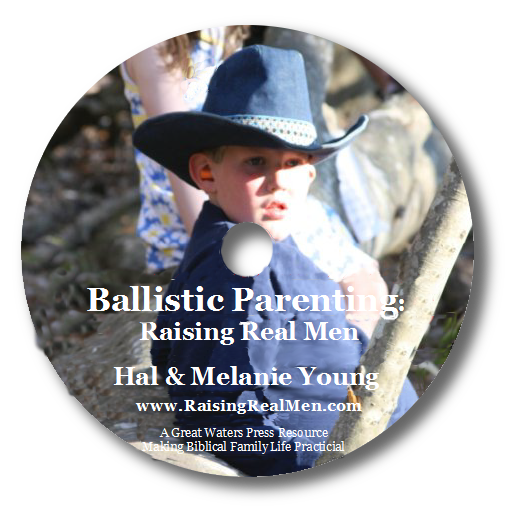 We believe that mock combat is appropriate for boys to play because one of their God-given roles is to be the protector of their family, and if needed, their community and nation. This is just an easy way to keep it healthy between brothers. 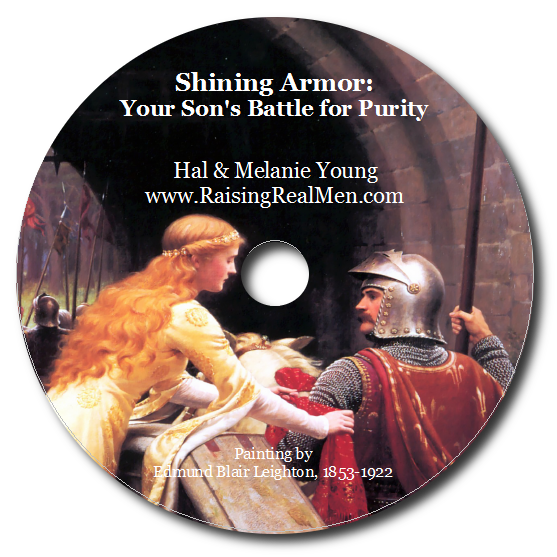 For more on how to help boys turn their natural aggression to righteous purposes, plus lots more on raising boys, check out our award-winning book, Raising Real Men! 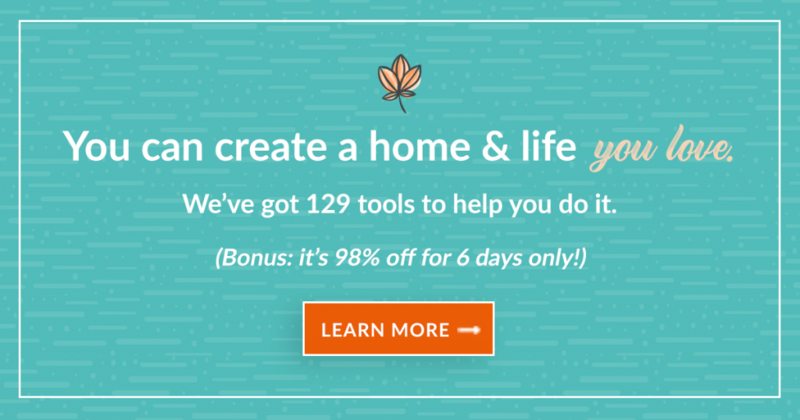 For great gifts and resources for your whole family (and especially your boys!) check out our store. Great Article. I agree whole heartedly! Boys should get the feeling of “fighting” in a controlled environment so they are not afraid to defend themselves and future families. I am also glad to hear you say down to earth things like, “Knock it off!” Sometimes with 5 boys, that’s all you have time to say! This is perfect. My boys will love the explanation having to do with fighter pilots and I think it will make a lot of sense to them. The OTHER good thing about teaching boys to stop immediately if they hear “stop” is it helps reinforce stop means stop, no means no, and it can help them later in life with women, or if they happen to overhear some woman telling some man “stop” and he isn’t stopping, our son could then know it is appropriate to intervene. Thank you for sharing a way to help boys to express and grow their protective drive. My 11 y/o recently took it upon himself to stand up for himself when a 10 y/o was threatening him at swim team practice. My son punched him in the shoulder. When I learned of it, I told my son that instead of punching, he should have told the coach about the bothersome boy. My son said he had told the coach many times last year during summer swim practice (the boy pulled down my son’s swim trunks when passing him in a lane, and repeatedly called names, threatened to kick, hit, etc) and that the coaches only told the boy to stop, but the boy would always start back up after a while. Please give me advice. Is it wrong for my son to physically push back? 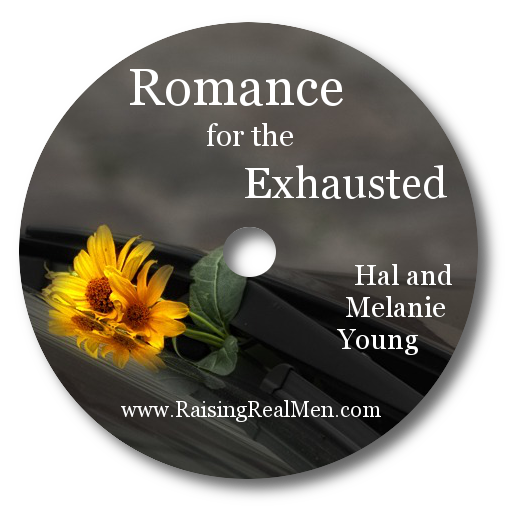 How should we as parents handle the problem of the boy who troubles our son? Many thanks in advance! This was great! Thank you!! I am going to use these with our boys. Lately I have just had a NO WRESTLING rule because someone gets hurt or angry within seconds. I think following these guidelines will help them to have healthier interactions. I am so sorry I didn’t see this sooner. We’ve had company from out of town and I just missed the notification! This is a tough situation. I would tell him that I am so sorry about last summer, that I didn’t know about it, but that he still needs to tell the coach this year and should have before it took it into his own hands. I would roleplay with him how to tell the coach, showing him how to say it seriously enough the coach pays attention, but without whining. If the coach does nothing again, though, your son needs to be able to stick up for himself, even if that gets him in trouble. We have told our boys, “Don’t start a fight, but if someone else starts it, you finish it.” They need to be able to defend themselves and generally if you fight back at all, bullies back down immediately. The trouble is that our boys aren’t sneaky and mean like the bullies so they are likely to get caught and get in trouble. We’ve told our boys that if this happens, we will back him up. I would tell the coach that our son had been repeatedly bullied for over a year, that he told the coach but got no help, and he had no choice but to defend himself, that I hold the coach as responsible as the boys! One of our sons had a situation like this happen to him at a babysitting course! The boy, bigger by a head, had our son terrified. We talked to him about this, encouraged him to defend himself, and prayed with him. The next day, the bully cornered him in the bathroom and actually punched him. Our son socked him back, twice, and the big bully curled up in the floor and bawled like a baby, “I didn’t know you were so tough! Don’t hurt me!” The bully not only stopped bullying him, but stopped bullying everyone else, too! If more people stood up to bullies (or were allowed to! ), there would be fewer of them. Great article and response on the swimming situation. This is a great article. Even though I grew up with brothers, I am still surprised to see my boys wrestle and I don’t want to see one of them get hurt, yet I also want to raise them to be protectors. Thank you for this ministry you do for mommas like me.